bigger than in the past. Amma sang ‘Bandalo Bandalo’ bhajan at the end of the first day program and she requested every one to do the patty cake. The Japanese people generally are very quiet and humble. I think, they are not allowed to express their emotions publicly in their culture. But when Amma started singing and clapping to the ‘Bandalo Bandalo’ bhajan, even the Japanese people could not hide or control their emotions. They were laughing and clapping with great joy and some even started crying with joy! 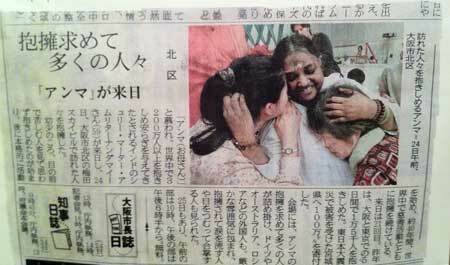 In Japan, a newspaper article would usually appear about Amma’s visit after Amma leaves Japan. Amma’s contribution to the tsunami that struck Japan in 2011 drew a lot of attention in the press and this time an article appeared in the Japanese newspaper ‘Osaka Nitiniti Sin Bun’ when Amma was still in Japan. On the second day (May 28th), Amma danced for the ‘Ayar Kula Kozunthey’ bhajan at the end of the evening program. 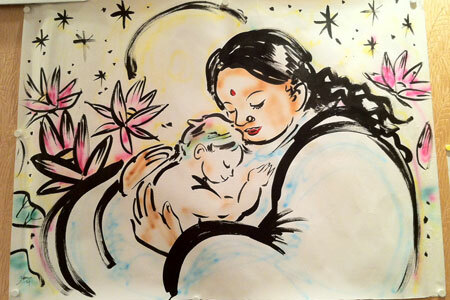 This is the first time the Japanese devotees witnessed Amma dancing. It was so beautiful and spontaneous that it completely took the shy and otherwise very genteel Japanese people by complete surprise. You could literally see their jaws drop and the excitement in the air. Amma clapped everybody’s hands as she was leaving the hall. When Amma’s palms touched each of the devotees’ palms, I am sure it left unforgettable memories for them to cherish forever. After the program, we felt an earthquake of 5.3 magnitude in Tokyo (no damages were reported). We were ‘not shaken’ by it since we were still in Divine Bliss by Amma’s Dance!